A few Saturdays ago we tested out one of Chef Glynn’s recipes at the Chill Zone, and much to our delight, this Apple and Fennel Salad turned out deliciously. For many of us, a salad is the first thing we think of when we think about eating healthy, and especially when we talk about eating vegetables. And while we most often think of lettuce and dressing as a salad’s main features, this dish can be so much more! Have you ever had a fruit salad? What about a tomato-cucumber salad? Salads can have any combination of fruits and vegetables, and can be topped with just about anything, including cheese, beans, nuts, seeds, and eggs! The possibilities are endless. The salad that we prepared at the Chill Zone is a great mix of the traditional with some exciting additions. 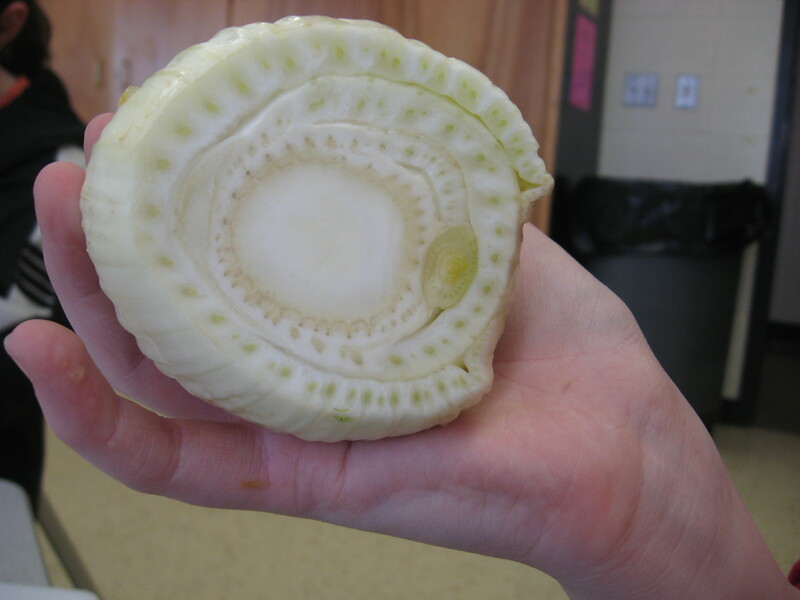 Perhaps the most exotic and interesting salad ingredient was the fennel bulb . 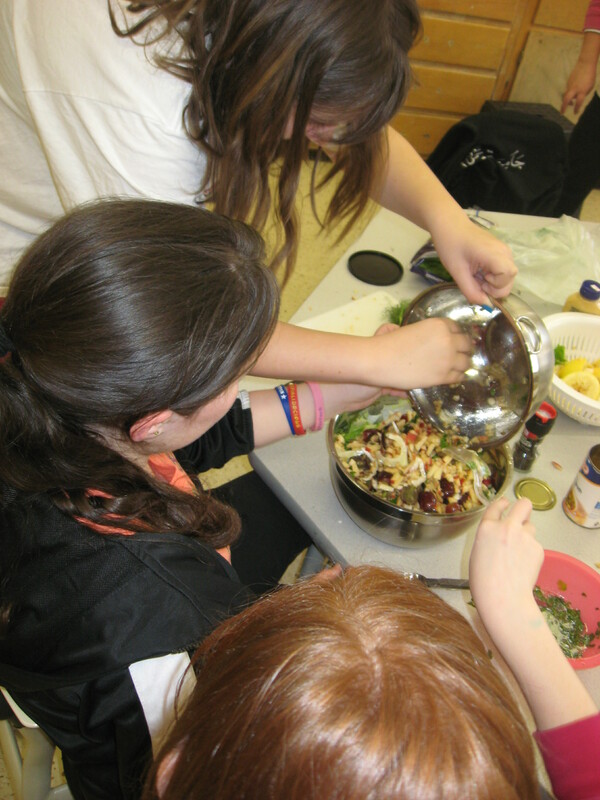 The girls who helped prepare the salad all took turns smelling a few crushed leaves from the fennel, trying to pinpoint why it smelled so familiar. The fennel smelled, strangely enough, like licorice! Although fennel and licorice plants are not technically related, they do share a very similar smell because both plants share an aromatic compound called anethole that gives them their distinctive flavor. The fennel definitely gave the salad a nice crunch and an interesting taste. After marveling over the fennel, we got down to work, washing and chopping up garlic, apples and grapes. 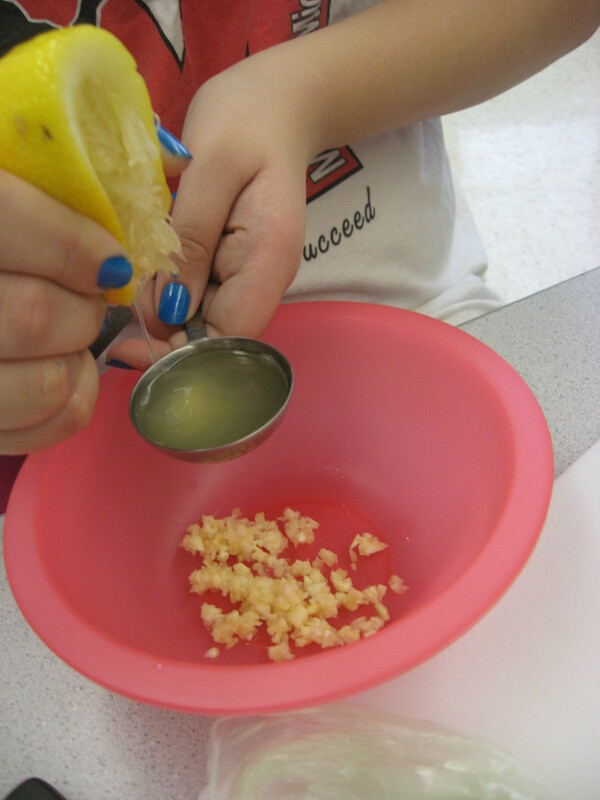 We squeezed fresh lemons and carefully picked parsley leaves to make the vinaigrette dressing. 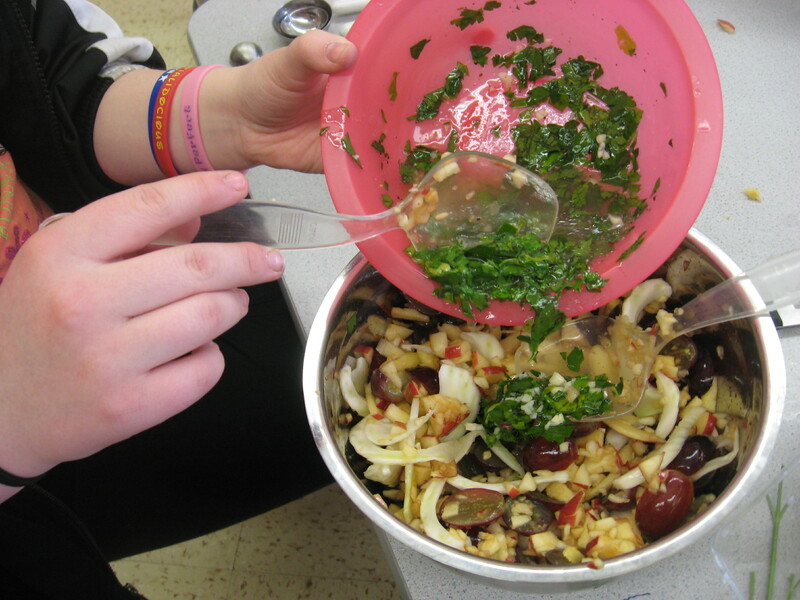 A basic vinaigrette salad dressing is made of 3 parts oil and 1 part vinegar, but there are infinite variations with different herbs and spices. Experiment with making your own vinaigrette dressings at home! After finishing up the dressing and fruit prep, we combined everything with some fresh romaine lettuce and a sprinkle of goat cheese. What a sweet way to welcome in the spring! Below is the recipe we used; we adapted Chef Glynn’s original recipe slightly to make it vegetarian (excluding the meat). Any recipe can be adapted if you don’t especially like one of the ingredients or would prefer something else; experimenting is a vital step in becoming a great chef! It may not always turn out quite the same way as the original, but practice makes perfect. Before long, you’ll be making up your own delectable recipes. 1. To prepare the vinaigrette, mince garlic, then add vegetable broth, parsley, lemon juice, cider vinegar, olive oil, and black pepper. Stir until well blended and set aside. 2. 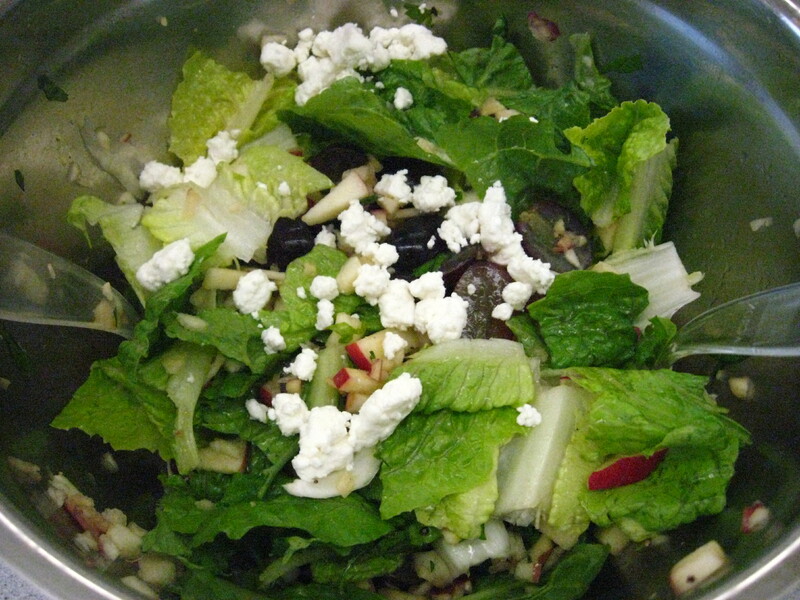 To prepare the salad, combine washed romaine and place it on a serving platter. In a large separate bowl, combine apples, fennel, and grapes. Pour about 1/2 of the vinaigrette over the apple mixture and toss gently to coat. Spoon apple mixture over lettuce. Sprinkle with goat cheese. Spoon remaining vinaigrette over salad and serve immediately. Recipe from Healthy Waltham’s own Chef Glynn. Images by Cece Watkins (2011).